With more than 1 million visits every year and a location at the centre of one of Manchester’s newest developments, First Street, HOME is right at the heart of the city’s cultural and commercial regeneration. Thanks to our unique combination of international theatre, art and film and exceptional community and creative learning initiatives, we boast event and meeting spaces offering a fantastic atmosphere. We’re an inspiring partner for any business looking to engage its staff or clients, reach new audiences, or expand its corporate social responsibility. Our stunning glass fronted rooftop event space and bar overlooks the new public square and creates a unique hospitality venue. We aim to provide unforgettable experiences for your staff and clients and give you real opportunities for engagement. Sponsor a project or activity at HOME and associate your brand with creativity, entrepreneurship and experimentation. 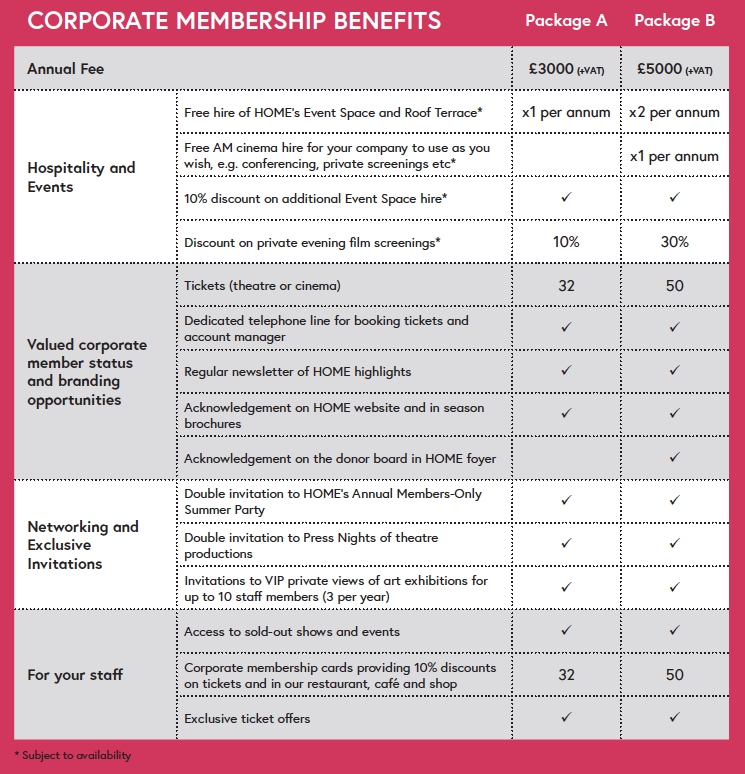 Make the most of our facilities and become a corporate member. Corporate members enjoy a generous package of opportunities to engage staff, clients and friends including cinema and theatre tickets, complimentary event hire, major discounts on private cinema screenings, exclusive invitations to special events throughout the year, and discounts for your staff in our restaurant and café.